Take a half-hour’s drive south of the coastal city of Florence, and you’ll pass through the quiet riverside communities of Gardiner and Reedsport. 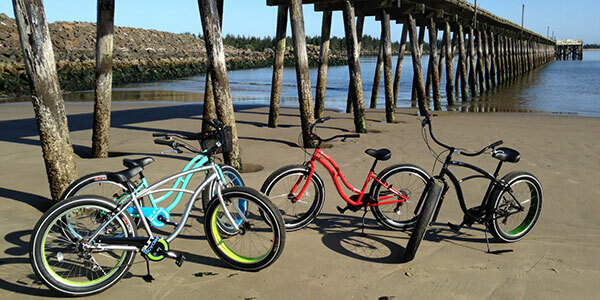 Go just a few minutes further down the road and you’re at Salmon Harbor in Winchester Bay. The whole region has a population of about 5,000 people, so you’ll never feel crowded wherever you go. It’s considered a prime crabbing location, perhaps the best in the Pacific Northwest and certainly one of the finest in the country. 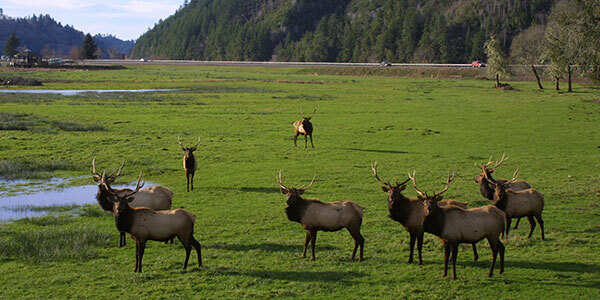 Wildlife lovers will be thrilled with the multitude of birds to be seen in the Bolon Island Tideways State Scenic Corridor and the majestic elk herds living in the Dean Creek Elk Preserve. Oregon Dunes National Recreation Area offers the largest sand dunes in the country and a magnificent stretch of empty beaches to explore. There are 13 campgrounds where you can stay within the 40-mile stretch that covers 31,000 acres, with 30 freshwater lakes, rivers and streams to drop a fishing line in. The Lower Umpqua Fly Casters host an exposition every February in Reedsport. 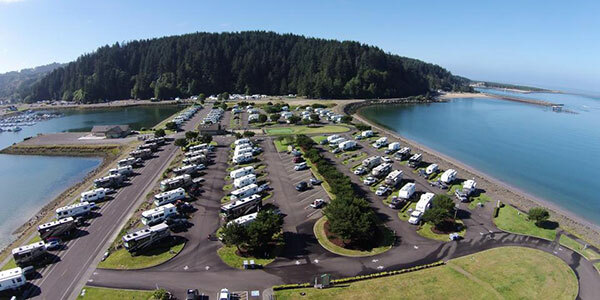 The Winchester Bay RV Resort offers one of the most unique camping locations you’ll ever find, where every space has a waterfront view. During football season at the Marina Activity Center, games are shown on the 16-ft. big screen! Game Day weekends begin Oct. 15. 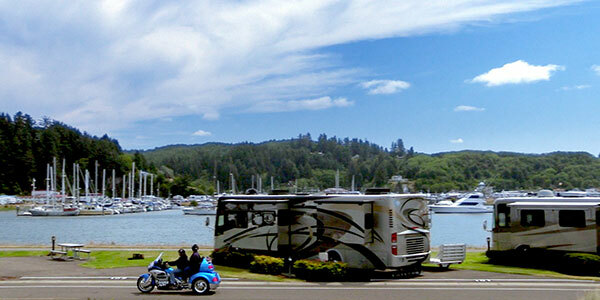 Located where the mouth of Umpqua River meets the Pacific Ocean at beautiful Salmon Harbor Marina! Grey whales begin their southern migration in December and return north every March. 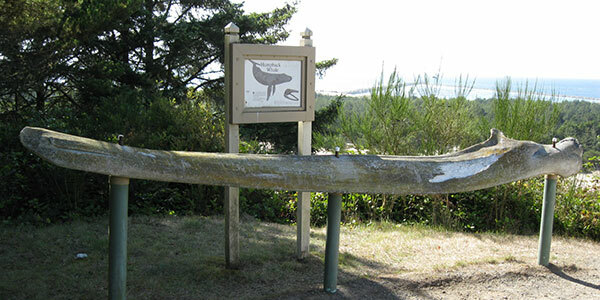 The Umpqua River Whale Watching Station near the Umpqua Lighthouse often has the highest number of sightings of all the 26 whale watching stations on the Oregon Coast. Professional chainsaw sculpture carvers from around the world gather at Rainbow Plaza in Reedsport for the Oregon Divisional Chainsaw Sculpting Championships in June. Every July the five-day Dune Fest draws thousands of ATV enthusiasts for sand races and challenges, with some spectacular show-quality dune buggies and quads on display and for sale. Old Time Fiddlers is an August event featuring musicians singing and playing fiddles, guitars, banjos and mandolins at the Grange Hall, the Gazebo, in campgrounds and on the docks around town. Kool Coastal Nights is also in August, a Fri.-Sat. car event with a Show ‘n Shine, a Parade of Champions, a Harbor Cruise and a 1950s-style street dance with live music. The annual Salmon Derby each September coincides with the fall Chinook salmon run. Local tackle shops have registration forms and rules for a chance to win daily prizes for the biggest salmon caught.